UPDATE of TOWN: The revitalization of Downtown Brownsville is happening in multiple ways. *Brownsville Area Revitalization Corporation (BARC) a 501c3 non profit was established in 1989 as a Community Development Corporation to help revitalize historic properties. BARC operates two museums in the Flatiron Building located at 69 Market Street. A Memorial/Honor sidewalk surrounds the building. * Students in Action was established in 2011 when a group of students from our Brownsville School District planned and raised funds to build theCast Iron Amphitheater in the heart of downtown near the Cast Iron Bridge. * Cast Iron Gallery, opened by a private investor, Mr. Beckman, is a photography gallery showcasing photos of Brownsville’s past and present. The building also offers residential space and is located at 200 Bank Street. * American Legion has repurposed its building as a community center on Brownsville Avenue. *Penn Dot Project will be the renovations of the first Cast Iron Bridge in America that traverses the Dunlap Creek near the Iron Bridge Amphitheater. Plans to begin in 2020. This will showcase the unique bridge as a tourist attraction. *St Peter Church Recreational/Social Hall ground breaking occurred on Dec 16, 2018 with goal to have the building open in Fall of 2019. Inside sports for all ages, faith formation classes and social hall. Iron Bridge Crossings residents consist of locals, former residents and some new faces in town. The residents are a delight, as the property manager Lisa Adkins stated. Jim Claar, of Community Action Agency, provides weekly activities. When asked ‘what is there to do in Brownsville’, I was inspired to share some of the perks our small town offers. 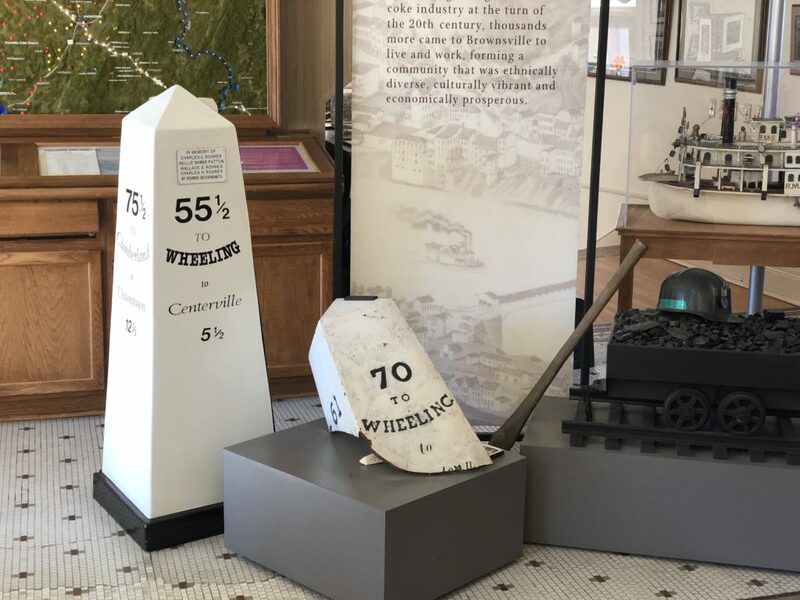 The most significant is Nemacolin Castle, a 22-room house-museum dating back to 1789, located on Front St.
Flatiron Building Heritage Center tells the stories of the town’s peak and valley eras with an outstanding array of artifacts from the past. Visit the local-focus gift shop. Located at 69 Market St.
Frank L. Melega Art Museum has original art by Mr. Melega with a focus on the industries of the area. Visiting artists are featured throughout the year to showcase talents. The art museum adjoins the heritage center at 69 Market. Mr. Melega’a art is available to purchase. Transportation Museum tells the stories of the Road, the Rail and the River through artifacts and photos. Located at 412 Church Street. History *Brownsville was once known as a ‘town of churches’. As immigrants settled in Brownsville to work in our coal mines, on the railroads, or in the boat building industry, they brought their faiths with them and, with their outstanding skills, built our beautiful churches. The oldest church in town is the Historic Church of St. Peter, built in 1845 by Irish stonemasons. Call 724-785-7781 for tours. FACT Brownsville has the first Cast Iron Bridge in America, located on Market Street over the Dunlap Creek. This historic bridge has multiple awards including the ASM award that is also bestowed on the Eiffel Tower in France, and on the Statue of Liberty. FACT: Brownsville has two historic districts; The Northside Historic District and the Downtown Commercial Historic District. There are also six individually listed sites on the National Register: Nemacolin Castle, Front Street; Historic Church of St Peter, Shaffner Ave; Dunlap Creek Bridge, downtown (the first cast iron bridge in America), the Intercounty Bridge, over the Mon, the Thompson House, Water St. and the Temple O’Have Israel Synagogue, Second Street. What is happening in the town? *Greater Area Chamber of Commerce is a membership of all businesses and supporters of the town. They welcome the Christmas Season with ‘Light up Night’ on the day after Thanksgiving. Luminaries light up the town. A large Fire Truck parade brings Mr. & Mrs. Santa Claus to town. The parade ends at a location where Santa takes time to listen to children’s requests and gives them a treat. The weekly electronic newsletter provides current information about the town and events. Chamber office is located at 325 Market Street. Phone is 724-785-4160. * Brownsville Area Ministerial Association (BAMA) is a coalition of Church leaders and welcomes volunteers for their events such as Lenten Devotions during the six weeks of Lent. Each week the service is held at a different church with a visiting pastor. The Chamber Newsletter has the schedule. In addition to the coalition of ministers, most of the town’s churches have support groups and events to serve the public. Call 724-785-3201 for more info. *Rotary Club provides a talent show and supports all community events. During special occasions, they display flags along the downtown streets. * Center in the Woods Senior Center offers senior services and events at 120 Woodland Court.724-938-3554. * Northside Beautification, an organization of local residents, keeps the gateway to the community looking bright by planting flower pots along the streets and displaying flags in the Historic District. They also sponsor special tours of historic homes. FMI contact Jeff at 724-880-6528. *Military Memorial is in process to be built near the Amphitheater to honor area service people. FMI 724-366-2113. *Guided tours of the town are available Call 724-785-9331. Individual Walking Tour of upper Market Street is available call 724-322-2422. * Food Banks The town offers two food banks: one at the First Methodist Church 215 Church St, the third Wednesday of each month, and at Calvin Presbyterian Church at 307 Spring Street on the fourth Saturday of each month. * Brownsville Riverside Wharf Park located at the end of Bank Street is within walking distance of the downtown area. The beautiful Wharf is a great place to fish or to take a book and relax on your own chair or the benches provided. Boat slips are available. * Nearby California University offers many entertaining events for the public to attend such as sport games, theater performances and speaking forums. Check the weekly newsletter. FMI call 724-938-4000. * Fallingwater, a world renowned house museum, is open to the public a few times each year at no cost to Fayette County residents. Brownsville and Fayette County offer many sites to see and places to enjoy –From the Mountains to the River !!! * *The town’s events and happenings are all listed in the Chamber newsletter that arrives via e-mail each Monday. Contact connie.gore@att.net for the free newsletter. Check the weekly Chamber newsletter for local restaurants’ menus.